Wolves in Mammoth, April 24, 2009On our drive to work this morning, my co-worker and I stopped to observe five wolves in Mammoth Hot Springs wandering and resting on a small hillside frosted with last night’s snow. A few other fellow staff members also gazed at the wolves, along with some park visitors. All shared the same look of delight. I did not have my good camera with me (first rule of thumb--always bring your camera along in Yellowstone) but I was able to make a short video. This afternoon, another happy wolf surprise arrived in a letter from the Yellowstone Park Foundation. One of my close friends, Susan McCarthy, had made a donation to the non-profit to purchase a radio collar for the Yellowstone Wolf Project. She had requested that they inscribe the collar “For My Friend Beth Pratt.” Susan—you are too wonderful—what a special gift! 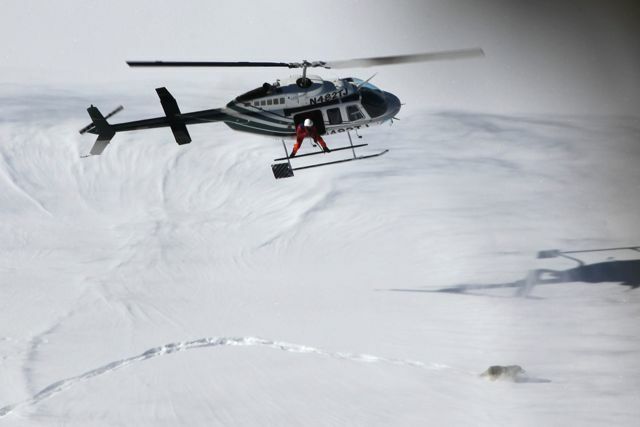 Over the winter, Doug Smith, the Wolf Project leader, and his crew collared a number of wolves. 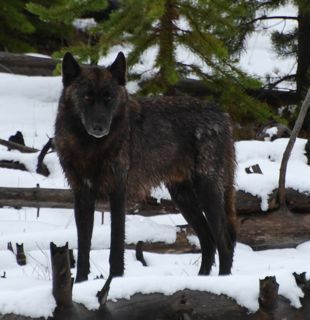 My collar was placed on wolf 495M, a six-year old black alpha male of Mollie’s Pack and also at 143 pounds, the largest wolf ever recorded in Yellowstone National Park. We must share a love of good food! 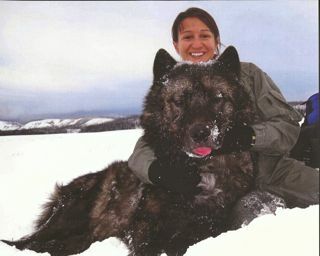 Wolf Project Technician and Wolf 495M during collaring operations, January 2009. 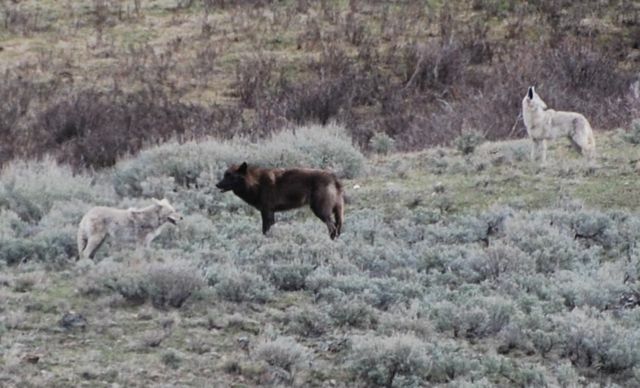 Photo courtesy of the Wolf Project, YellowstoneThe letter from the Foundation relates a comment from the park researcher: “As the two sedated wolves came into view…we saw what looked to be a gray wolf next to a good sized black bear. We immediately joked with Wolf Project leader Doug Smith that he had darted the wrong species, but indeed it was a wolf, the 143 pound alpha male 495M.” When I think of this magnificent creature bounding through the park with my name on his collar, I admit I get a bit teary-eyed. Doug Smith and crew—thank you for all the incredible work you do with wolves in the park! 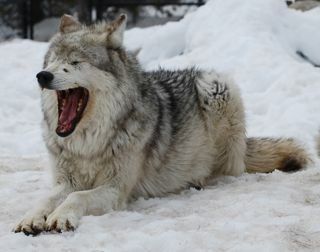 In 2007, I took a great course through the Yellowstone Association about wolves from Doug Smith. Our class was so inspired by his teaching that we pooled our resources to also sponsor a collar (and inscribed it with an Aldo Leopold quote), which was placed on wolf 482M. 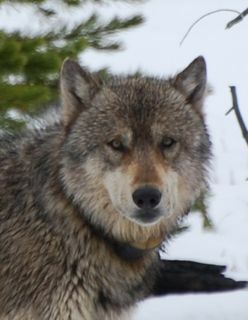 These collars enable researchers to gather valuable information about the wolves in the park. If you would like to consider funding a radio collar or donating to the Yellowstone Wolf Project, visit the Yellowstone Park Foundation’s website. 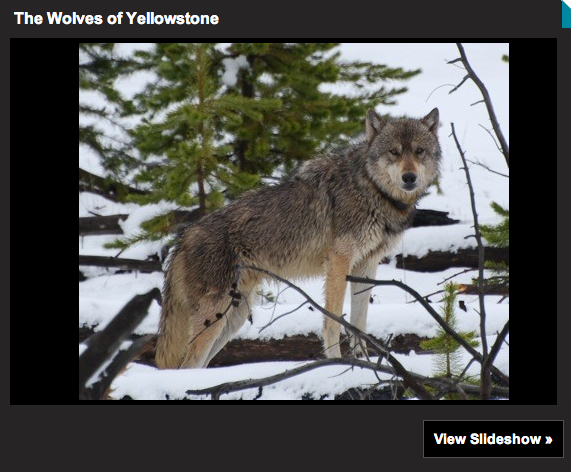 You can learn more about 495M and the Yellowstone wolves by visiting the National Park Service’s science pages. Doug Smith has also co-authored an excellent book about Yellowstone's wolf reintroduction called Decade of the Wolf. I’ll keep you posted on 495M’s adventures! 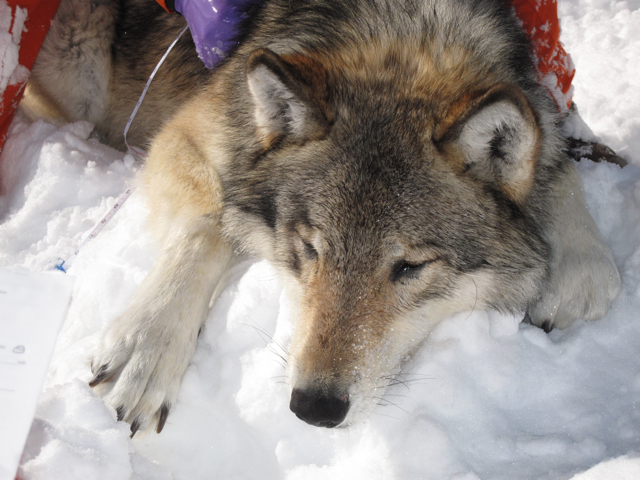 Wolf 314F (341F) under anesthesia after being fitted with GPS Collar (Montana Fish, Wildlife, Parks)In February, I wrote about the incredible journey of Yellowstone’s adventurous wolf 341F (she was previously misidentified as 314F). After departing from her pack in September, she wandered over a thousand miles and traveled through Montana, Wyoming, Utah, and Colorado. Since February, signals from her radio collar indicate she remained about 120 miles west of Denver. Wolf Crossing Gardner River, Spring 2008Two weeks ago when Shad visited me in Yellowstone, we noticed in the basin across from the house a herd of elk on high alert standing atop one of the hills below Sepulcher Mountain. We scanned the landscape with binoculars and observed a dark wolf loping across the landscape. 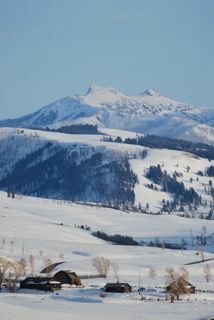 Shad had not seen a wolf in Yellowstone yet, and as luck would have it he didn’t even have to leave our yard to do so. 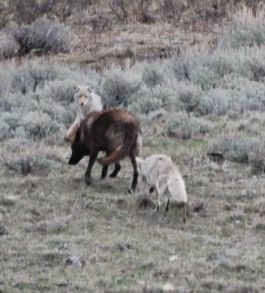 I checked with Doug Smith, the manager for the wolf project, and he said there have been quite a few sightings of the small quadrant pack below Sepulcher, along with a lone female wolf. Today, on my drive to Mammoth for a ski I saw Rick McIntyre’s yellow X-Terra parked on a turnout along with a crowd of people equipped with spotting scopes—a sure sign of canis lupus activity. Lamar Valley has always been the prime spot in Yellowstone for wolf watching; if the wolves keep making an appearance near the north entrance perhaps this winter I’ll save on gasoline if I don’t have to drive to Lamar to gaze at wolves. Slough Creek from Specimen RidgeYellowstone’s expanse of rolling hillsides and gentle meadows appear endless in most areas of the park, and today I gazed at miles of this sublime landscape. 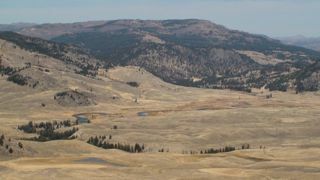 I ventured up Specimen Ridge, which overlooks Lamar Valley to the northeast, and the Grand Canyon of the Yellowstone to the south. The trail wanders through sub-alpine meadows, all a comforting shade of brown with the arrival of fall. Small patches of the bright yellow dress of aspen trees decorated distant ridges. A lone bison munched on the sparse fare, and raised his head to consider my presence. Not wanting to disturb him (nor get charged) I gave him a wide berth. Wolves frequent this area, although I was not lucky enough to see any today. The territories of the Slough, Druid, and Agate packs all intersect near Specimen Ridge and recent entries on the trail register indicate sightings. The name Specimen Ridge, according to Yellowstone Place Names, originates from prospectors, as the area was known for its specimens of amethysts. Amethyst Mountain, 9,614 feet, is the highest point on the ridge. I made a quick video of the 360 views from the north end of Specimen Ridge. Yesterday a federal judge halted the killing of the gray wolf—at least temporarily—by reinstating their protection under the Endangered Species Act. 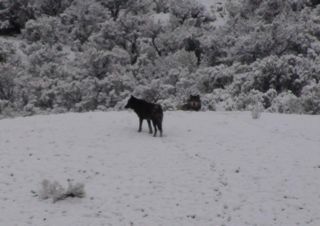 The Natural Resources Defense Council, The Center for Biological Diversity, Defenders of Wildlife, and other non-profit wildlife advocates successfully argued that the wolves had not met the set recovery goal, and that the state of Wyoming had failed to implement an adequate management plan to protect the species. I celebrated with a toast of sake (having no champagne in the house). The slaughter of wolves once the protection was lifted in April was truly disturbing to watch. According to the NRDC, 106 wolves have been killed since then—at a rate of almost one a day. I think I might have set a new record for rapid wildlife sightings in Yellowstone. 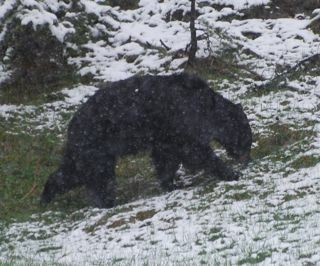 On my drive back to Mammoth from the Grand Tetons, I encountered what can only be described as a “wildlife hotspot.” I pulled my car over to watch a black bear amble on a hillside and took some photos of it through the snow flakes. I had not even traveled a quarter of a mile up the road when I sighted a grizzly bear in the surrounding forest. But wait, there’s more! A half a mile up the road, I observed a bunch of cars on the shoulder, a sure sign of wildlife activity. 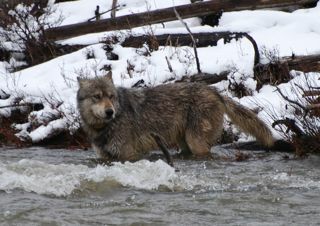 I quickly saw the reason for the crowd--two beautiful wolves were crossing the Gardiner River. Here’s a photo collage of my wolf and bear sightings. I am still recovering from the euphoria that accompanies a wildlife overdose! What do mountain goats, bighorn sheep, grizzly bears, bison and bison calves, pronghorn antelope, coyotes, sandhill cranes, red-tailed hawks, wolves and wolf pups, elk and mule deer all have in common? We observed all of these animals today in Yellowstone. 6:15 am: Grizzly bear traffic jam just fifteen minutes into our trip as we passed over the bridge spanning the Yellowstone river. We observed from the relative safety of our bus as the bear rambled along the road. 6:45 am: It’s never too early for a dose of cuteness. A large herd of bison with about five drowsy baby calves rested in a meadow near Roosevelt. 6:50 am: At Floating Island Lake, our guide shows us a nesting sandhill crane, which on my own I might have taken for a small rock. After a short time the feathered mass stands and through our binoculars we are able to see her eggs. Just for affect a red-tailed hawk soars overhead. 9:00 am-11:00 am: Barbara, our guide, spots a lone collared black wolf sitting by the river, which is later identified as female 526. Rick, via the radio wolf network, credits the Yellowstone Association with the sighting, which is akin to being thanked by Audubon for a spotting a bird. 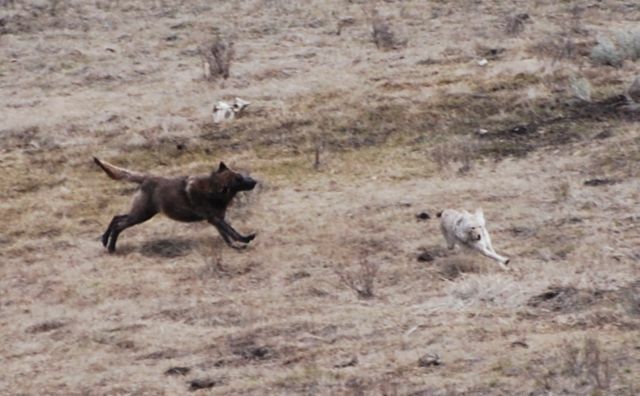 Suddenly 526 dashes down the bank of the river, meets up with five other wolves, and after chasing a pregnant cow elk in the river, they take her down. After the hunt, one wolf trots off with her unborn fetus—a grisly reminder of the indifference of Mother Nature. While we watch the wolves, a coyote trots among us searching for food. 1:00 pm: Barbara scouts the snow-covered ridges of Barronette Peak, searching for mountain goats and within a few minutes has found some scurrying on the perilous cliffs. On an opposite facing ridge, we find four bighorn sheep. 1:30 pm: On our return drive through Lamar Valley, Ariana notices four red-tailed hawks soaring low over a meadow, and a herd of pronghorn dashing down from a ridge. We stop and spot a lone dark wolf and three coyotes giving chase to each other, a truly mesmerizing sight. Although the game could have deadly consequences, the two species appear at play, teasing each other with feints and charges. At one point they call a truce and rest, and one coyote gives a loud howl. On my way home from Old Faithful this evening, I spotted a beautiful black wolf at the end of an expansive meadow. I gazed at him--and he at me---for at least fifteen minutes before he trotted into the woods. 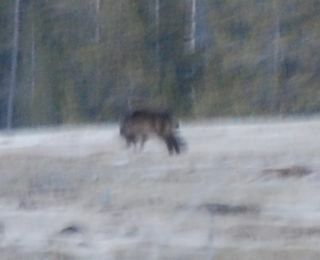 Here's my first official photo of a wolf in the wild--a very blurry shot as I don't have a big enough lens. Not exactly a prize-winning photo, but I like the mysterious, eerie cast of the out-of-focus wolf shape. 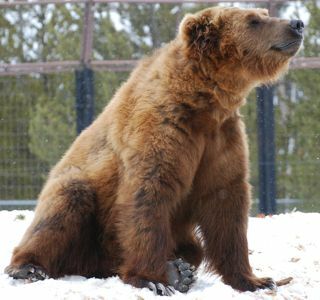 While I stayed in West Yellowstone this week, I took an afternoon and explored the Grizzly & Wolf Discovery Center, a non-profit wildlife park dedicated to educating the public about the grizzly bear and the grey wolf. The non-profit GWDC was formed in 1999 in order to purchase the center from a private company and to focus the center on education rather than entertainment; the site is now an Association of Zoos and Aquariums certified facility. 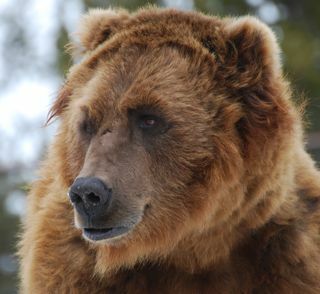 The bears and wolves at the center have been relocated from a variety of areas, most having been labeled "problems" and would probably have been killed otherwise. The exhibits tell each animals' story, and also provide a wealth of information about wild bears and wolves. GWDC offers wonderful viewing opportunities of these magnificent animals, along with a number of excellent educational activities. I spent hours just watching the animals-- the wolves trotting friskily around the park, the grizzlies playfully wrestling. Sam and Illie are the bears pictured; the wolves are the Gallatin Pack. 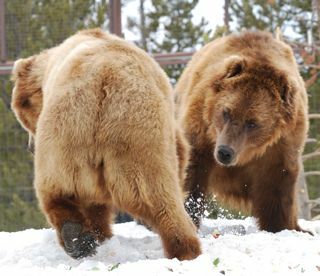 Sam and Illie wandered into an Alaskan fishing village in 1996 after their mother disappeared and were soon relocated to GWDC. At the end of our wolf study course last November, Jack Laws organized an impromptu group fundraiser for our class to sponsor a radio collar for the Yellowstone Wolf Project through the Yellowstone Park Foundation (a great non-profit!). Our collar was placed on wolf 482M, the alpha male for the Gibbon Meadow Pack in the park. 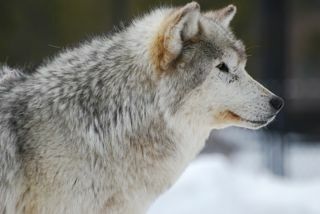 Doug Smith, the leader of the wolf project, told me 482M was one of the biggest wolves they've ever captured for study. 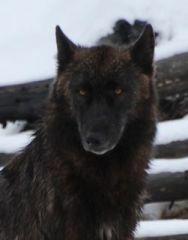 He's certainly a beautiful wolf--see below. I hope to see him trotting through a meadow someday as I hike in the park. Today I played hooky from work--with the approval of my boss--and attended a Yellowstone Association class, Skis Across Yellowstone. Dr. James Halfpenny (Jim) taught the class and literally wrote the book on our subject matter--his Winter: An Ecological Handbook is one of the definitive works on winter ecology. An amazing naturalist and educator with over a thirty-year history in Yellowstone and a global travel log to be envied, he also runs an ecology education center and museum in Gardiner that offers field courses in Yellowstone and around the world. I'm saving my pennies so I can attend his Polar Bears of the Arctic trip. The class returned me to my second favorite place on earth (Tuolumne Meadows being my first)--Lamar Valley. After a cozy night in my cabin, I arose early and joined the faithful wolf watching crew (with Rick and his yellow Xterra) at Slough Creek campground. I gazed at members of the Druid pack while they frolicked on Specimen Ridge. One wolf played with what appeared to be a discarded radio collar; another bantered with ravens. Before they trotted off into the forest the pack provided us with a farewell group howl. (Sorry-still no wolf photos--my scope adaptor for my camera is still on order). 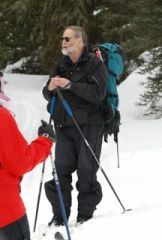 After breakfast, Jim led the class on a delightful ski along the base of Barronette peak. We dug snowpits, took temperature and density measurements, and learned terms like depth hoar. I also enthusiastically volunteered to help with counting animal tracks using a really cool GPS device. We observed the tracks of multiple snowshoe hares, grouse, martens, coyotes, moose, and one snowshoer. On my return trip home I navigated several bison jams and stopped once more at Slough Creek to watch wolves. 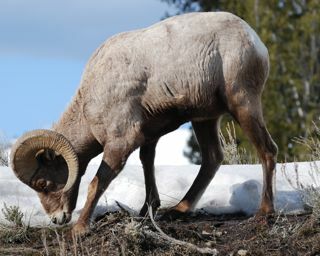 Near Roosevelt, I turned a corner and suddenly beheld a bighorn sheep not five feet from the road. My failed quest over the weekend had been suddenly realized. I parked the car and got my camera ready. He munched away, and considered me for only a moment before resuming his meal. With my naked eye I could count the ridges on his horns. I was mesmerized and sat on a rock for a half an hour simply watching him nibble forage. What is it about the presence of wildness that stops us in our tracks? I have been utterly amazed and captivated by the sheer beauty of seeing wolves frolic in the wild. 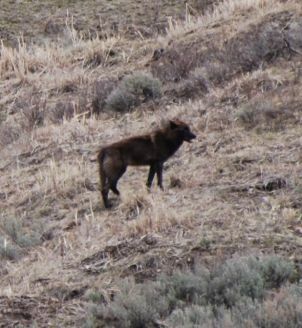 The sight of a wolf loping through a herd of bison nearly drove me to tears today. 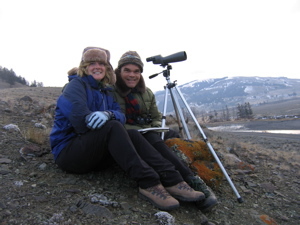 My fellow intrepid explorer buddy, Jack Laws joined me for a two-day wolf study course in Yellowstone with Doug Smith, the project manager for the Yellowstone Wolf Project. 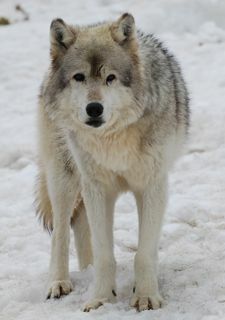 He’s been overseeing the wolf reintroduction since nearly the beginning and he literally wrote the book on the project. A humble, intelligent man of incredible achievements, he has managed one of the most significant and controversial projects of our time and I learned much from him over just two days. On our last day in Yellowstone, Jack and I took a hike down the Lamar River. In the middle of our hike we came across fresh grizzly tracks roughly the size of my head. Jack’s first reaction, “Do you mind if I take some time and sketch these?” Truly, dedication. I stood watch with my bear spray in hand, not wanting to interfere with the artistic process.